If you had to look back over 2010, what would be the most resonating lesson you learned? For me, it was having the privilege of watching Duncan McLaughlin manage the hoof care of 12 or more horses over a period of nine weeks. Three of those horses belonged to me and sometimes his verbal evaluations shocked me. And sometimes his hoof trimming strategies shocked me, too. 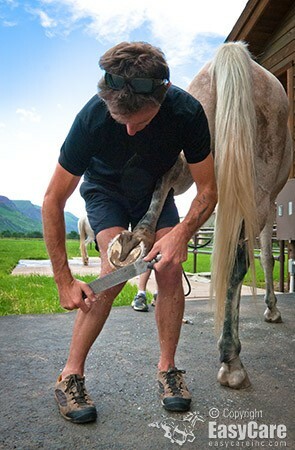 The resonating lesson I learned from Dunc is that you just can’t be lathtargic about hoof care. Don’t get me wrong – it’s not like you have to devote your entire life to it. But if you make a commitment to yourself and to your horse, you can genuinely affect the health and quality of your horse’s feet over time. And yes, although you may kick out at me, it also has a direct relationship to the way hoof boots fit. This horse, Katie, is owned by Susan Morgan. Katie’s shoes were pulled last Saturday. Which boot would you use initially on this foot? 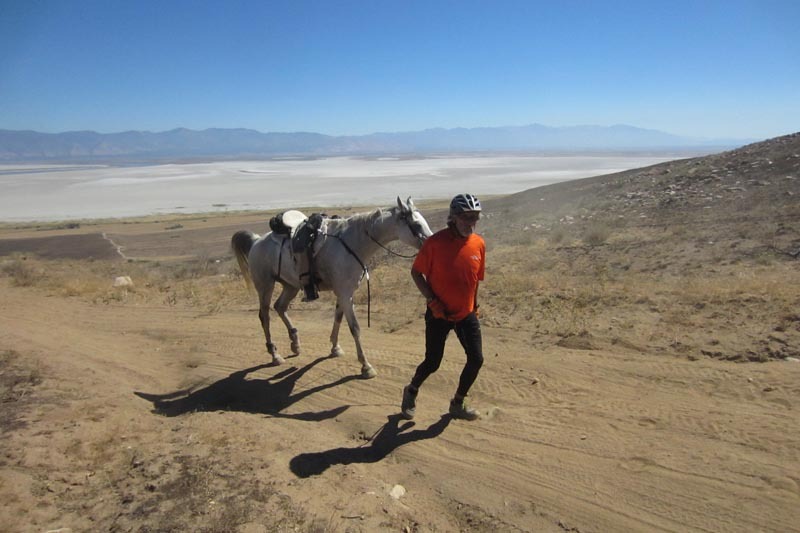 The lesson was driven home over the holidays when some good friends came to Arizona to ride at the three-day Resoluion Ride. One or two of them had been having trouble keeping boots on from time to time, particularly in rough and extremely steep terrain. I’m not an expert: I’m just an amateur addicted to a sense of accomplishment. But I do see recurring themes when it comes to the topic of boot fit and staying power. It’s all about the toe. We are trying to fit a three-dimensional object based on two-dimensional measurements. 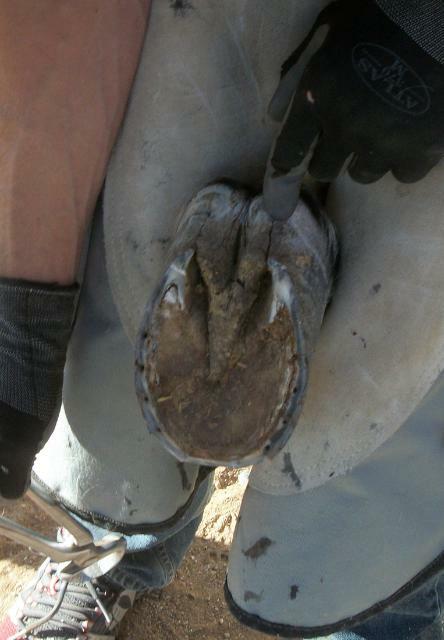 The angle of a horse’s hoof has a dramatic effect on boot fit as well as the ongoing health of the hoof itself. If you are managing the care of a horse with low angles or toe flare or hoofwall separation, then you should be aware of the effect the angle has on the way the boots fit. In the case of the Easyboot Glove, for instance, if there is gapping between the top of the boot shell and the hoof wall, you are at a higher risk for boot twisting or loss. You can offset this risk using aids like athetic tape and power straps, but those solutions won’t be as effective on the most extreme cases. I strongly believe that long toes can create the same issues as I mention above. Lucy’s blog last week reminded me that there are certain times of the year when weather or travel or health affect our ability to manage the three dimensions of the foot. Here is Katie, out on her first ride immediately after pulling the shoes. That’s *a lot* of athletic tape to fill the gap (and over the coronet band, which I tend to avoid), but kudos to them! As the toe length and hoof angles are managed, the hoof will grow down more tightly from the coronet band, making the flare further down the hoofwall look even more pronounced and possibly creating more gapping at the top of the boot in the process. In other words, it is possible that fit could get worse before it gets better. 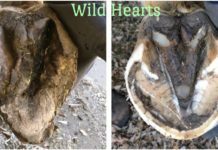 No matter what, it is vital that you get the ongoing advice and opinion of a hoof care professional. They know much more than we do about angles, length of toe and what can and can’t be done. If you don’t have an HCP in your area you trust, then find one you like on line and seek his or her advice. You may consider paying to get a photographic evaluation done of a horse. 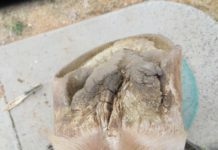 If your horse is working regularly, and assuming you are committed to getting the heathiest hooves you can, you will almost certainly have to rasp the toe back, scoop the quarters and keep an eye on the heels every two weeks. If my working horses had to wait six or eight weeks between being touched, there would be long toes and broken out quarters. And all this, of course, affects what goes on at the heel. If you’re not comfortable learning basic maintenance, talk to your HCP and see if you can negotiate a three-week cycle for less money per visit. I know of two HCPs who do this because they are able to better manage the health and shape of the hoof. Know this: learning the mustang roll as a way to hold the trim between HCP visits is not as scary as you might think. And your HCP will be delighted when you ask her to show you how to do it. Not all feet are shaped equally. The biggest change in my horses’ feet happened not after pulling the shoes, but after aggressively managing the toe nine months into the transition. If your horses feet are shaped in such a way that a certain boot (such at the Glove) won’t fit correctly, and if you truly believe the hoof shape will not significantly change, there are alternative boot models that are more flexible. The Epic continues to be a favorite with many people (and in 2011 it will get the Glove tread). Although there are more moving parts, the boot fit is adjustable. And some of the highest mileage riders in our hoof boot contest still use them, so don’t count them out. 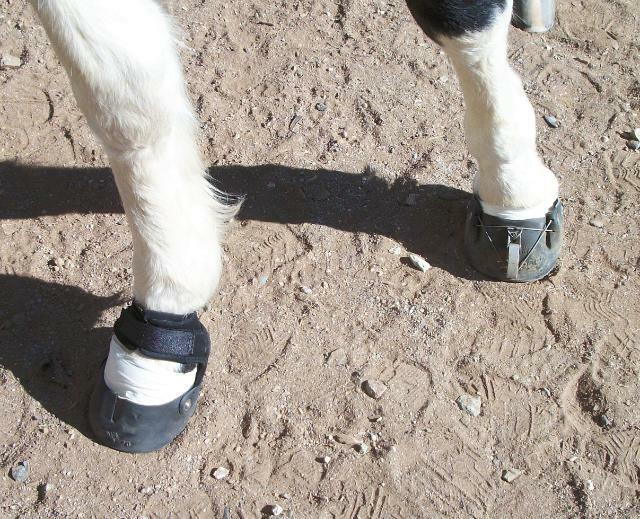 Realize, too that as your horse’s feet change, your boot fit and type may also change. The number of people successfully using boots across all riding types and discilplines continues to grow at an impressive rate. If you know someone who is having success with boots, ask them what works. And if your protocol has reached the point of ongoing success, then pass it on. Do you have anything to add to my list? Add a comment below. If you subscribe to this blog via RSS, click here and scroll to the bottom of the page. I am responsible for the marketing and branding of the EasyCare product line. I believe there is a great deal to be gained from the strategy of using booted protection for horses, no matter what the job you have for your horse.